Mondays call for chocolate and what better way than in the form of truffles?! 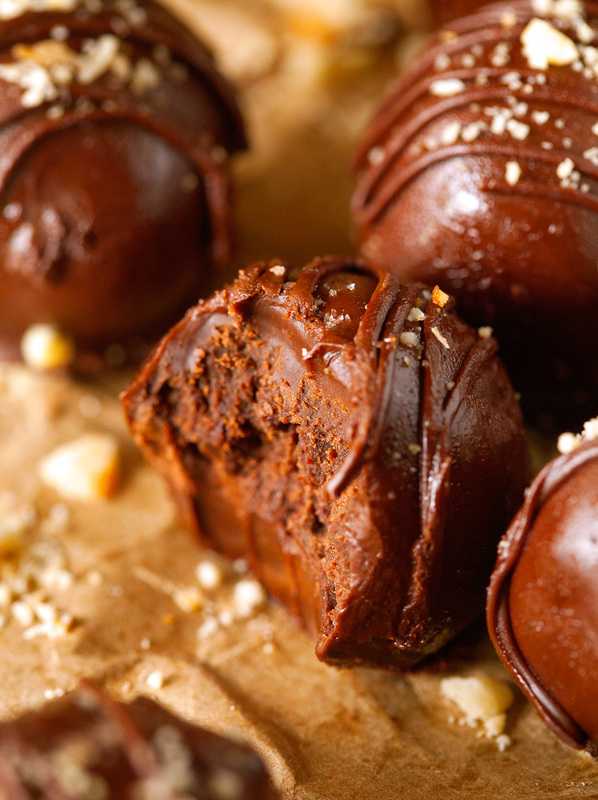 These are not your average truffles though, they’re made with Nutella! Happy Monday morning to you! This weekend seemed to have passed in lightning speed, which I’d foreseen. Time always flies fast when you’re having fun. And the last couple of days were packed with more than enough. I’ll have some pictures to share with you later this week, but I first need to sort through image after image of mouthwatering food. 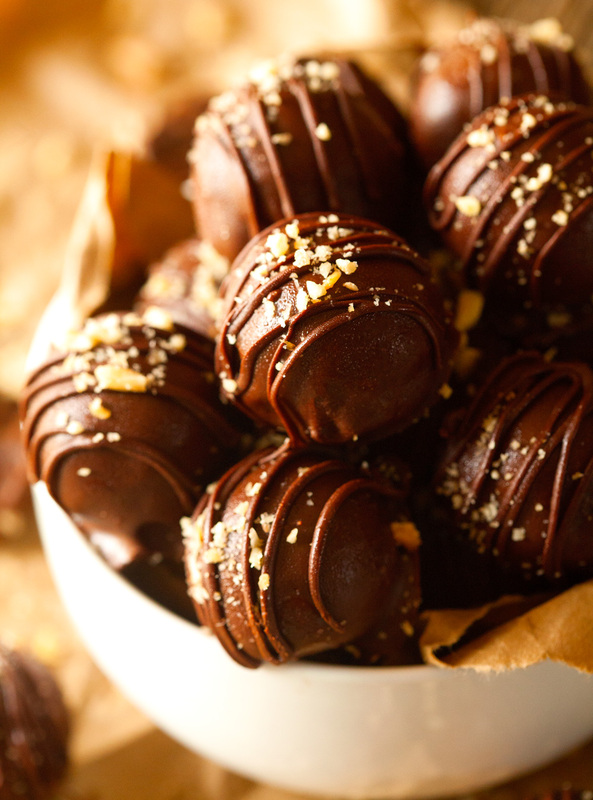 Meanwhile, why don’t we concentrate on something else that’s also more than drool-inducing: Nutella Truffles. Since chocolate basically runs through my veins, there is no escaping Nutella. Whoever invented that luscious chocolate spread and basically made it perfectly acceptable to enjoy chocolate first thing in the morning, was a pure genius. But it certainly doesn’t have to stop there. There are so many different ways to enjoy it throughout the day and right now, incorporating it into truffles, is my favorite by far. I clearly have a thing for truffles. This is my sixth truffle recipe I posted and there’s no end in sight! I seriously have a long, long, long, and sweet list of different versions to try. That’s what I love so much about them. They’re super versatile, no-bake, and perfectly poppable. Plus, truffles are pretty hard to mess up. No matter what skill level you have in the kitchen, you’ll be able to create a sweet treat that easily impresses and tastes absolutely indulgent. Even little ones can help in the process. They’d have a fabulous time rolling the chocolate base into truffle shapes -let’s be honest, who wouldn’t love playing with chocolate? Besides taste and simplicity, another reason why these particular truffles are so great is that you only need 4 ingredients to make them. If you’re anything like me, you might even have all of the ingredients already on hand. 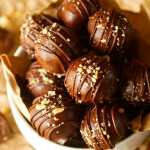 The hazelnuts are optional, but I like to sprinkle them on top to give the truffles a little bit of crunch and texture. Plus, they look even prettier with that touch of “Hazelnut Dust”. You’ll essentially whip up a chocolate mixture that resembles ganache (think thick chocolate sauce). It needs to chill for a couple of hours in the fridge before you can form it into balls with your hands. If you’re not a big fan of dipping things in chocolate, you could even skip that step and roll the truffles in the hazelnut dust. Either way, they’ll be just as good. I instantly feel better about Mondays when looking and eating one of these. Make it a great start to your week, friends! 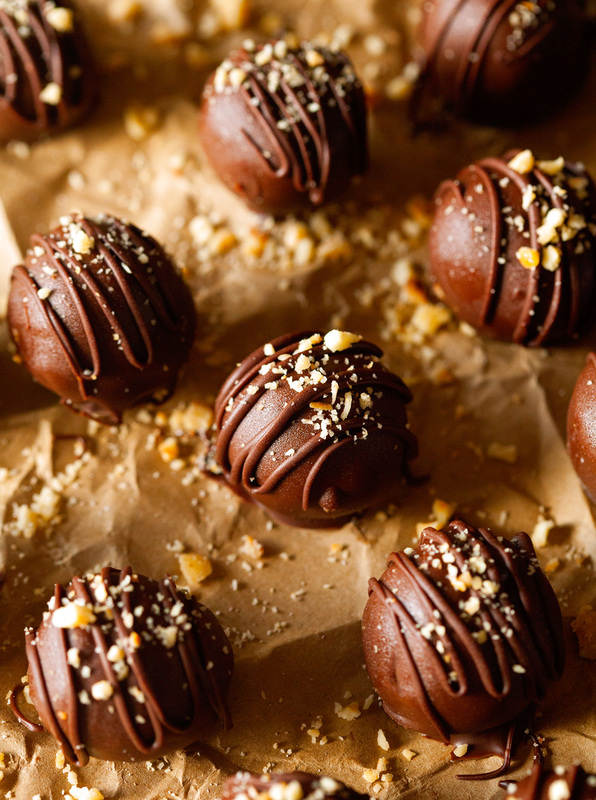 Nutella Truffles are a chocolaty indulgence in a bite. They're fudgy, satisfying and oh so good! 1. Place 10 ounces of the chocolate into a medium bowl. Using the microwave or your stove, heat up heavy cream until hot, but not boiling. Pour over the chocolate and let stand for 1-2 minutes. Using a rubber spatula, stir mixture until fully combined and chocolate is melted. Stir in chocolate hazelnut spread and cover with plastic wrap. Refrigerate for 2 hours or until set. 2. With the help of a small cookie scoop (about 1 teaspoon), scoop out chocolate mixture and form into balls. Place onto prepared cookie sheet and place in the freezer for 15-30 minutes. 4. Heat remaining chocolate in a microwave-safe bowl until completely melted. Add oil, if using, and stir to combine. 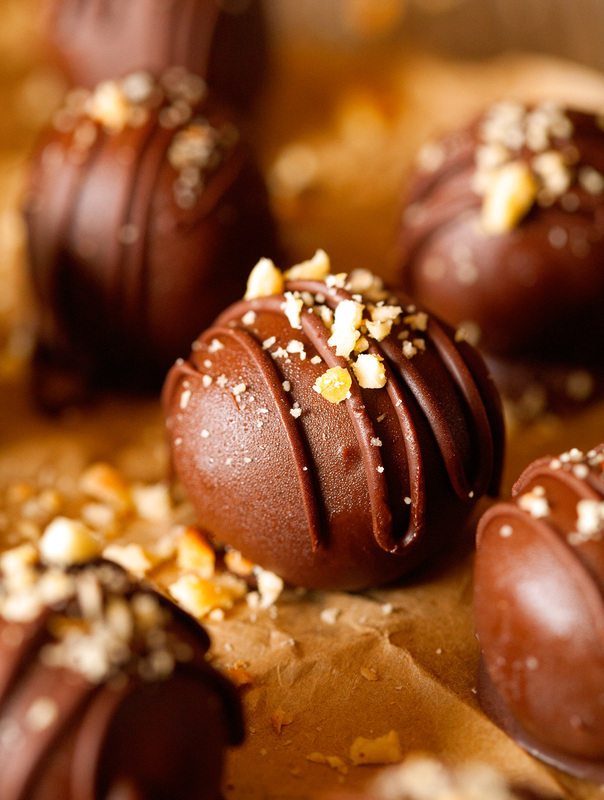 Remove chocolate balls form the freezer and place one ball at a time into the melted chocolate. Using a fork, evenly coat each ball with the chocolate. Use the fork to remove the truffle from the chocolate and before transferring it back to the baking sheet, slightly tap the fork against the side of the bowl to get rid of any excess chocolate. Place on the baking sheet and repeat with remaining chocolate balls. Pour leftover melted chocolate into a small ziptop bag, cut off one corner and pipe melted chocolate in desired design on top and finish with hazelnuts. 5. Return truffles to the fridge or freezer for 15 minutes or until truffles are set. Devour! 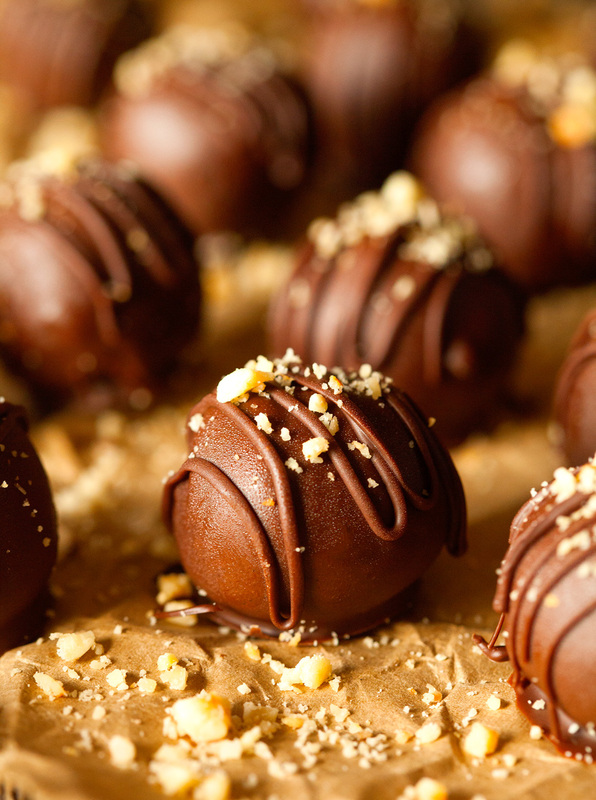 Nutella Truffles will keep up to 7 days stored in the fridge or up to 4 weeks in the freezer. I am drooling over these cuties, Kathi! Nutells is my weakness! I’m so impressed that you made these into a truffle. Why haven’t I thought of this before?! Amazing! Pinned! Ha. I totally hear you. I ALWAYS have chocolate on hand, but Nutella only makes its way into my shopping cart every so often for the very same reason :). The pics have everything to do with the State Fair! We had a blast yesterday! You should definitely consider going – it’s always so worth it. Thanks, Kelly. Hope you’re having a fab Monday! Oh wow! These sound epic. They would be perfect to give out as Christmas gifts too. Omg I’m drooling over these! Quick question, is it 1/2 cup of Nutella or container? I’m guessing cup? I had the same question! These truffles look amazing! I updated the recipe. Thanks, ladies! my chocolate cravings have definitely kicked in.. love anything nutella related! Me too! Thank you so much, Thalia!! Thank you so much, Alice. You are too sweet. Hope you’re having a great week so far!! just fried my keyboard bc I am DROOLING like a damn puppy over these. seriously incredible. Haha. Thanks for making me laugh – you’re the best!! Oh my goodness! These not only sound amazing – Nutella is the jam! – but the pictures are absolutely beautiful! I don’t think I’ve ever seen a more perfect truffle! Your comment totally made my day. Thank you so much, Lindsay!! Those are some perfect truffles, lady! I mean they look better than most expensive ones I’ve seen. Of course I’m sold on them because of the Nutella! Yay for Nutella! Nutella is the best. Thank you, Leah!! You are welcome to come and get some anytime :). Thank you!! Oh wow, these look dangerously good! Nutella is a favorite of mine. Of course! Thank you so much for sharing them and for your sweet comment, Olivia! Hi! I did I whole batch of these last night, I stored them in the freezer, since I´m using them for Valentine´s Day and want them to be fudgy, do I place them in the fridge? You don’t have to. You can leave them in the freezer until 2 hours before you’re ready to enjoy them. I usually start dethawing them in the fridge for 1 1/2 hours and then take them out and let them sit at room temperature for 20-30 minutes. Hope that helps! These look awesome. Would they melt, if I made them and took them to class to have after 2 hours? Really want to try these! Just wondered about the size of the balls – I have a small Oxo cookie scoop which is 2 tspns. In your directions, you say to use a small cookie scoop (about 1 tspn.). Can I use my scoop or will it make these truffles too big at 2 tspns.? Thank you! I’ve tried making this recipe several times and the chocolate never fully melts. Not worth the time and effort. Hey there 🙂 I had the exact same issue. The cream was certainly hot enough (but not boiling), but I don’t feel as though there was enough of it to completely melt all of the chocolate. I thought I would try to counter that by putting it in the microwave for a few 5 second blasts…unfortunately I ended up with a very altered state of my “ganache” that resembled the love child of mud and mousse! 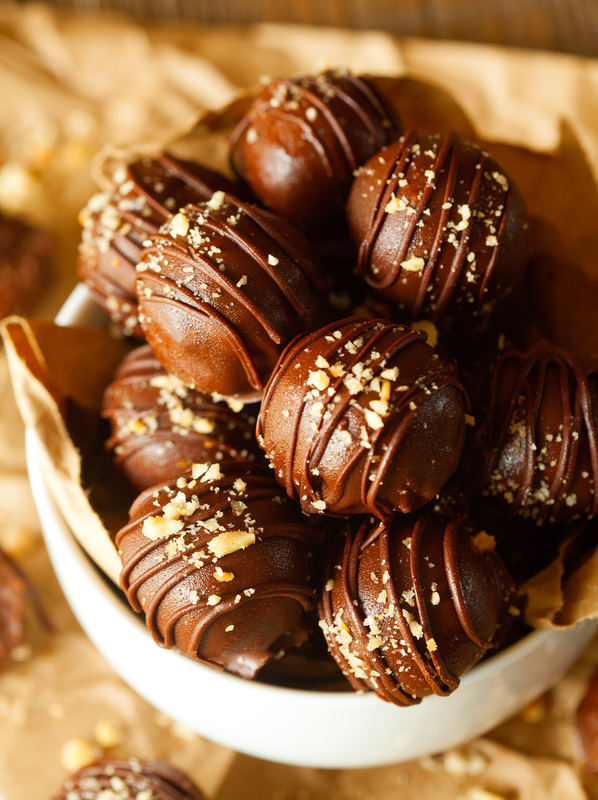 I’m disappointed because I looked through quite a few Nutella truffle recipes and decided on this one as they look amazing! Anyone else have this problem? Try melting the chocolate in a double boiler (A glass bowl over a pot of water for me) and then slowly add the cream after it all has melted. I would like to try this recipe (it sounds wonderfully delicious) but I’m uncertain about the amount of chocolate to use. When you say “14 ounces of semi-sweet chocolate” do you mean by weight or volume? By weight, it would be 2 ounces short of a pound, and by volume, it would be 1 and 3/4 cups. These are the best chocolates every…it tastes better if u make it from your hands…..i m glad that you made this recipe so yum ….n delicious..
Can you add a dash of rum to these Nutella’s tuffels? Has anyone made these with milk chocolate? I don’t have any semi sweet at the moment and want to make some! Yours are perfect! Nutella is made by Ferrero. So the middle of Ferrero Rocher IS Nutella. I wish I could figure out a way to keep the Nutella filling “pure” and dip around it.